A beautiful kit with an incredible sound to match - and all at a surprisingly wallet-friendly price. Looks stunning. Excellent sounds. Loud. Heavy. Bass drum head will switching for smaller venues. Despite being a relative newbie to the drum scene, Crush Drums has an impressively packed gear catalogue. The firm only officially launched in early 2011 (landing in the UK ￼￼￼￼￼￼earlier this year thanks to a distribution deal with Sound Technology), but the US company already has a stellar range of kits and snares. Back in November we sampled their Sublime E3 Maple kit, and this month we have an entirely different prospect - Crush's Acrylic set. Decades on from the sight of John Bonham pounding his Ludwig Vistalites, acrylic drums remain evocative to all, yearned after by many but still dismissed by some. Recent years have seen an influx of companies producing acrylic snares and kits (these very pages have featured examples from the likes of Truth, Chequerplate, SJC and Spaun in ￼relatively recent times), and with so many now producing stellar acrylic shells, the notion of them being style over substance is quickly dissipating. But of course with more choice in the market, if you're going to do acrylic drums, you have to do them well. "On unpacking we can see that these are gorgeous drums"
On unpacking we can see that these are gorgeous drums. We're reviewing a four-piece kit - 22"x18" bass drum, 10"x7" and 12"x8" racks and a 16"x14" floor tom. There is no snare with this set. The kit features seamless acrylic shells and 2.3mm tom hoops, while bass drum hoops are made from acrylic. Bearing edges are double 45°, and closer inspection shows that these are crafted with pinpoint precision. Twelve unobtrusive lugs are found on the toms, with 16 on the floor and 20 on the bass drum. The kit also ships with X-Suspension tom mounts and two-position bass drum spurs as standard. 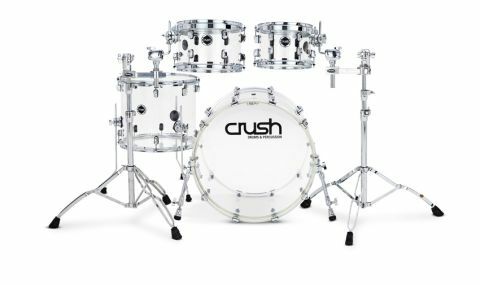 Crush claims its construction process sees the 100 percent seamless acrylic shells pack ￼￼￼an increased strength and a more refined tone when compared to its competitors. This is also said to bring with it added warmth. One minor gripe that can be levelled at the kit as a whole right off the bat is that the supplied heads won't be to everyone's taste. Having said that, they are up to the job and, being clear heads, they certainly look the part. We switched them out for our tried and trusted brand and quickly found our desired sound. But as always, this comes down to personal preference. "The shells are seamless and crystal clear, and the hardware is sympathetic to the overall aesthetic"
What first strikes us about the Crush kit is its simple beauty. The shells are seamless and crystal clear, and the hardware is sympathetic to the overall aesthetic. It is a relief that Crush hasn't gone the full-on bling route and added flash to an already attention-grabbing kit. On putting stick to head, the kit's quality becomes abundantly clear. First off, the rack toms ring out a sweet ping, but they are also capable of incredible depth to their tone. Rolls between the 10" and 12" racks are beautifully articulated and with minimal tuning you really can make these drums sing. And so it's off to gig with these beauties. On lugging the Crush kit to the car, it only takes a few steps before this reviewer realises that this is one beefy kit - real muscle-sappers. Once we've managed to hustle them into the venue, the comments from onlooking punters quickly follow. Yes, you will certainly get noticed when unpacking this kit. In fact, this reviewer has only played one other set-up that attracted as much of a pre-gig furore, and that was Chequerplate's LED inset acrylic kit. All of which just ramps up the pressure to make sure this kit sounds as good as it looks. Back in the rehearsal room we had been surprised by the beast of a bass drum - it was all boom, as each bury of the beater into head threatened to cause a major rip in the space-time continuum. There's no hole in the front of the drum's head and, of course, with this being an acrylic kit shoving a pillow in between the batter and resonant head might not be the best of looks, so we instead address the head to help tame the sound. Not wanting to cause a roof cave-in at our local venue, a quick head change to a well-known pre-muffled bass drum batter head was necessary and brought with it a more refined sound. On stepping away from the kit and taking a listen to the bass player pummelling his size nines into the bass pedal, that decision was quickly vindicated - the kick now sounds out with a warm thud rather than a terrifying boom. The toms need very little fine-tuning, perfect for a set of rock staples right from the off. The floor in particular packs an incredible punch and almost begs you to channel the spirit of Bonham and play with wrist-pummelling power.